Magnesium is an essential mineral that's necessary for good health, including proper mental functioning. Although some research links magnesium deficiency to depression, there is no established recommended magnesium dosage for depression treatment. It is important to consult your physician before taking magnesium or other dietary supplements to treat depression. Dietary magnesium is necessary in order to prevent magnesium deficiency, which may cause a number of symptoms, including anxiety, insomnia, irritability and possibly depression. In addition to low dietary magnesium intake, other factors that may contribute to magnesium deficiency include prolonged stress, excessive sweating, heavy menstrual periods and getting too much salt, alcohol, coffee or soda. Magnesium deficiency is not uncommon in the United States, and it occurs more frequently among women, African Americans and the elderly, according to MedlinePlus. Per the Recommended Dietary Allowance, or RDA, men need 400 to 420 mg of dietary magnesium per day, while women need 310 to 320 mg daily. Magnesium intake from dietary supplements should not exceed 350 mg/day, however. According to review published in "Medical Hypotheses" in 2006 and 2010, magnesium deficiency is a major cause of depression. Magnesium supplementation may thus function as an effective treatment for depression. A 2008 clinical trial referenced in the review showed that magnesium was as effective as a tricyclic antidepressant in treating depression in diabetics, and animal studies also show orally-administered magnesium produced strong antidepressant effects. Additionally, case histories indicate rapid recovery from major depression using a magnesium dosage of 125 to 310 mg with each meal and at bedtime. It is important to note, however, that these experimental dosages for depression treatment are higher than those considered safe by health authorities, and you should not attempt to self-treat depression by taking such high doses of magnesium. According to MedlinePlus, magnesium doses of less than 350 mg/day are safe for most adults. However, taking large doses may cause magnesium levels to build up in the body, resulting in serious side effects such as low blood pressure, confusion, irregular heartbeat, coma and death. It may also be unsafe to take magnesium supplements if you are taking certain medications or for people with certain health conditions. According to MedlinePlus, taking magnesium supplements is dangerous if you have kidney problems or kidney failure, as healthy kidneys are necessary to properly metabolize magnesium. Magnesium may also cause moderate drug interactions with the following types of medications: antibiotics, bisphosphates, calcium channel blockers, muscle relaxants and diuretics. Additionally, magnesium supplements may interact with other dietary supplements including calcium, boron, vitamin D, malic acid and zinc. According to the National Institutes of Health, the best way to get extra magnesium is to eat a variety of whole grains, legumes, and dark, leafy vegetables. Certain types of fish and nuts also provide magnesium. According to the NIH, a 3-oz. serving of cooked halibut provides 90 mg of magnesium, or 20 percent of the Daily Value for magnesium set by the U.S. Food and Drug Administration. Other foods that are especially high in magnesium, each providing 20 percent of the DV, include a 1-oz. serving of dry roasted almonds, cashews, or mixed nuts; a 1/2-cup serving of cooked soybeans; and 1/2 cup of cooked spinach. 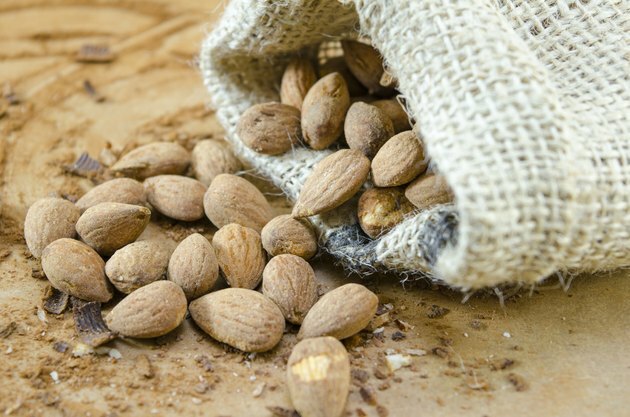 Baked potatoes, peanut butter, fortified oatmeal, yogurt, and brown, long-grained rice are some other common foods that are good dietary sources of magnesium.